When it comes to core Wild Turkey expressions, the one I hear most often about (outside of 101, of course) is Rare Breed. It truly is a fan favorite. From casual sippers to die-hard enthusiasts, folks from all around love Rare Breed. And it only makes sense, as it scratches an itch that other Turkey expressions don’t. It’s barrel proof, it’s batched from three distinct maturities, and it costs considerably less than Booker’s (which on paper is probably its closest competition). But not all Rare Breed batches are equal. Some are phenomenal, some are just okay, and right in the middle of phenomenal and okay sits one particular batch … 03RB. Rare Breed batch 03RB is unique in two ways. First, it’s the longest-produced Rare Breed batch to date (nearly 10 years). Second, it’s likely the only Wild Turkey expression outside of Decades to contain whiskey from all three barrel entry proofs: 107, 110, and 115. Beginning in 2004, sporting a black neck wrap near-identical to RB batch 01-99, and ending in 2013 with the more common transparent neck wrap, there’s a hell of a lot of batch 03RB out there to be found. Personally, I’ve owned minis, pints, and fifths. There’s even fifths in tubes. And if you look hard enough all of these versions can still be found on retail shelves today. But one question has plagued my mind for some time now … do all bottle dates of 03RB share the same profile? Surely not – at least they would’ve all had to originate from one massive batch. Thanks to Bruce Russell, we recently learned that Rare Breed 03RB wasn’t a single gigantic batch, tanked and released over 9+ years. Instead, 03RB was released as different batches bottled with the same label/proof. Now wait – I know what you’re thinking. How did Wild Turkey reach barrel-proof bottling at 108.2 every single time? Well, regulations do allow for some minor variance in labeling something “barrel proof.” That considered, all Jimmy and Eddie Russell had to do was get really close. According to Bruce, sometimes that meant changing ratios of barrel ages – especially when whiskey from the newer entry proofs started working themselves into the batches. It was ultimately a balancing act of profile and proof. You know – stuff Jimmy probably does in his sleep. Today I’ll be comparing two different Rare Breed 03RB batches: a 2009 50 ml mini bottle and a 2012 375 ml pint. I presently have two other dates I could work into this lineup, but I think I’ll save those for another time. Tasting four different barrel-proof KSBW’s side-by-side, all while capturing subtle nuances and taking accurate notes, might prove difficult … fun (no doubt), but difficult. As for the two I’m comparing today, there’s an entry proof difference to consider beforehand. While the 2009 bottle should contain whiskey barreled at 107 proof, the 2012 likely contains a combination of whiskey barreled at 107, 110, and/or 115 proof. It should be interesting to see how things shake out. Oh, and special thanks to John Clarke for making this possible. And with that, on to the tasting! Overall: This 2009 Rare Breed is very much classic-profile Wild Turkey – in many ways like WT 101 from the same time period, but with increased cinnamon and peppery spice. It maintains enough vanilla/honey-maple sweetness and herbal/floral essence to keep the spice in check, though I’d hesitate to call this pour balanced. It’s interesting to note that the nose is somewhat deceiving, as I’m reminded of Rare Breed batch 01-99. Unfortunately, when this ‘09 hits the palate you realize the plot’s apparently changed (same show, different season). All in all, 2009’s 03RB is a solid release. Certainly a step down from batch 01-99 (especially in taste and finish), but a notable step over batch 112.8. At retail price it’s definitely worth picking up. Overall: I’ll have to say that Jimmy and Eddie do a mighty fine job matching profiles with whiskey barreled at different entry proofs. At least in comparison to the 2009 batch, 2012 is pretty darn close. There is some variance, however. 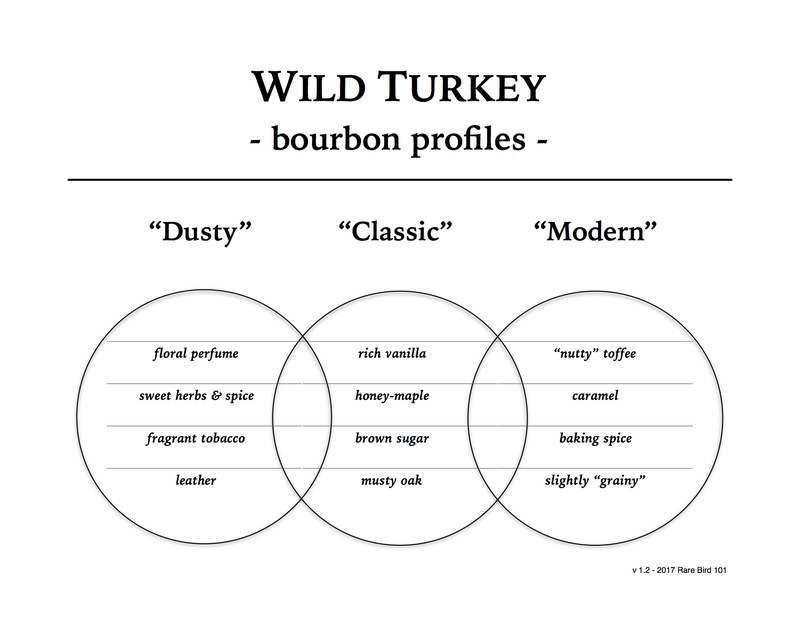 The most notable difference is a toffee presence I find more typically in modern Wild Turkey expressions. I’m assuming this comes from the 6-year bourbon in the batch (whiskey barreled at 110 and/or 115 proof). But it’s by no means a dominant note. There’s still plenty of classic honey-maple and musty oak to keep this from falling into a modern profile. Outside of that, there’s a bit less herbal/floral spice and a finish that’s slightly drier. Still, a very nice batch overall. Even with minor differences, 2012’s batch quality is near equivalent to 2009’s. In closing, I don’t think you’ll find enough differences between late 2000’s and early 2010’s Rare Breed 03RB releases to warrant chasing one year over another. True, I haven’t tried each and every year (and I still have some unopened bottles to dig into) but based on this tasting I’m going to wager my hypothesis is correct. I’ll also add that I don’t think anyone should spend a lot of energy chasing batch 03RB or pay secondary prices for it. Please don’t get me wrong … 03RB is a fine Rare Breed batch. There’s a lot of folks out there that like it much more than I do. I’ve even heard from inside sources that it’s Jimmy Russell’s favorite. But from my perspective I think there’s better Wild Turkey options out there – especially if/when 03RB can’t be found at retail price. Rare Breed batch 116.8 is probably the most relative example. But like LeVar Burton always said (yes, past tense – he gets sued when he says it now), you don’t have to take my word for it. Get out there, sample as many expressions as you can find, and most importantly, seek out and enjoy the Turkey you love. Cheers! Great informative review. I liked the info about it containing all three entry proofs! Thanks! At least somewhere around 2011-2013 it’s very likely. I always appreciate your comments. You should check out my Patreon page if you haven’t already (simply click the “become a patron” button). I have exclusive content there – recently a post about “tornado-surviving” Wild Turkey. You also get early access to all of my blog posts and numerous other rewards. I think you’d enjoy it.